With the London Olympics rapidly approaching it is necessary to plan ahead to minimise disruption for to your deliveries during the games. Stretching from May 2012 with the torch relay right the way through to September with the Paralympics the Olympic Games will present some logistical challenges. Euroclad is committed to providing excellent service throughout this period but recognises that it would be prudent to ensure that all customers are made aware of the restrictions that apply in and around the affected areas of London and the rest of the UK. Transport for London has provided advice and guidance about how London’s road network is expected to look during the Games. For more information visit tfl.gov.uk/2012. The maps show what impacts are expected at specific times and locations. They also highlight possible congestion hotspots, allowing you to plan your routes and delivery times more effectively. Reduce – Consolidate multiple orders into a single delivery to reduce journeys. The games are expected to provide a huge boost to the UK economy and should prove to be an exciting piece of history. By working together all of your deliveries can be optimised to minimise disruption and get your orders delivered in full and on time. Greig Downie has recently joined us as Health & Safety Manager. Greig is NEBOSH and IOSH qualified with over 20 years in manufacturing including experience of the legislative and practical measures required to ensure best practice health and safety management and compliance. Greig comes to us from Midas People Management where he was Health and Safety Director and Training Consultant. We are pleased to announce the appointment of Greig as Health and Safety Manager and look forward to benefitting from his skills and experience. Metal theft is estimated to cost at least £700 million a year to the UK economy and hundreds of properties are becoming targets to thieves who see the rising price of metals such as lead and zinc as an opportunity to cash in. The threat of metal robbery poses financial and structural implications for home owners and businesses, as well as community institutions such as schools, hospitals and places of worship. This can result in increased insurance premiums, large costs for repair and replacement and massive disruption to homeowners and businesses, not to mention the emotional trauma associated with being a victim of crime. Have you or your customers have been targeted by metal thieves, do you have concerns that your property could be next on the list or are you considering a new construction or building refurbishment? If so then it would be in your interests to consider a cost effective alternative to scrap-valuable metals that delivers the same performance with a significant reduction in the risk of theft. Vieo is a simple cost-effective alternative to traditional metal roofing which offers the aesthetic and charm of time-honoured materials like lead or zinc. 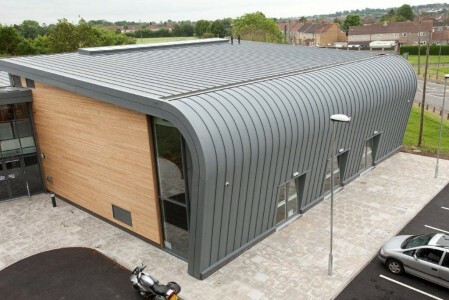 Vieo is available as a warm or cold roof and is suitable for use with residential, commercial and public buildings. The principle is simple and effective. A flat pan sheet features simple over and under laps each side. These laps sit over a stainless steel clip that is fixed to the substrate. The laps are mechanically folded over the clip in a straightforward, two-stage process. Rainwater goods, fabrications and flashings are available as Vieo system accessories. Whether Vieo is produced at Euroclad’s extensive manufacturing facility in South Wales or produced onsite, a high quality product with comprehensive technical support can be assured. Europlank cladding in Citroën white and red are providing impressive refurbishments of Citroën dealerships across the country. One that is clearly benefitting from this refurbishment programme is Bassetts in Bridgend. As an official Citroën dealership Bassetts pride themselves on offering a first class experience designed to meet all of the Citroën customers’ needs and expectations. To reflect this commitment to customer service and provide a ‘first class experience’ the bespoke panels fabricated by Euroclad provide an impressive, high quality finish; realising the Citroën corporate style of architecture whilst providing a functional and tailored finish. Another installation of our VIEO roof and wall product. Material – 3 coat PVdF 0.9mm Aluminium RAL 2004. Architect – Matthew Hill – Blackpool Borough Council. Main Contractor – Conlon Construction Ltd.
Sub-contractor – Leach Structural Steelwork Ltd.
Photo – courtesy of Architectural Steel Ltd.
You can now search the Euroclad project gallery using an interactive google map. If you’re looking to find a product or application in a particular part of the UK, you can zoom in to street level to see completed projects. And you can open the map full screen for ease of use. Whilst streetview doesn’t offer the close-up view of construction details that dedicated photography would provide, this new feature enables you to see the building in context and determine how effectively it complements or contrasts the local environment. If you’re considering using Euroclad products and want to view a typical installation in situ then this is an ideal feature for you. Sir Steve Redgrave and Sam Ramsamy, Executive Member of the International Olympic Committee, opened the Mayesbrook Athletics Arena in Barking and Dagenham yesterday. The arena, which is an official London 2012 Games Time Training Venue, has been completely refurbished using £2m funding from the Olympic Delivery Authority. We were pleased to supply the entire building envelope for this important development and our very own Jon Dore went along to the official opening.Timelapse Vieo of Mayesbrook. The LINEAR 4 rainscreen system was used as a Rainspan construction on the arena for its good looks and fast installation. LINEAR Rainspan is comprised of a rainscreen façade in aluminium composite material (ACM) that uses the Rainspan composite panel as a backing-wall. This eliminates the need for most secondary steelwork, saving both time and money by using a panel system spanning between the main columns. 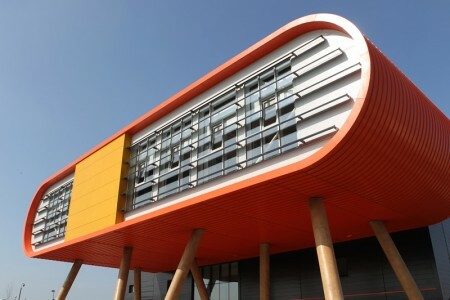 The LINEAR Rainscreen system is then fixed directly to the Rainspan panels. This type of construction minimises time onsite as well as providing a very cost effective solution to more traditional rainscreen assemblies. ACM is available in a huge range of colours and finishes and is even available in a range of natural metals such as stainless steel and titanium.